How Does This Legacy Live On? Thank you for participating in the MCA District Delegate election! Here are instructions to VOTE FOR A CHANGE. The candidates endorsed by Rename St*pleton for All are all passionate about Inclusion, Diversity, and Fairness. Hi! My name is Jaime Bower. I’m running for MCA District 1 Delegate because I believe we can do better to live out the promises of the “Green Book”, Stapleton’s Development Plan. Our neighborhood is thriving as a beautiful, walkable, environmentally sustainable neighborhood with a system of well-maintained open spaces, parks, and pools for residents; however, we fall short when it comes to the development’s guiding principle of social equity; socio-economic and racial diversity, inclusivity, and the creation of strong ties between us and surrounding neighborhoods. 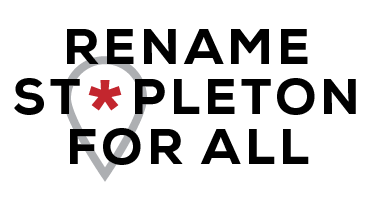 I believe that renaming our community is a big step forward, towards creating the welcoming space intended. We need to elect MCA District Delegates and Board members that exhibit the diverse intentions of the “Green Book”. We need to ensure that our community spaces, events, and programming are providing opportunities for people of all ages, incomes, and ethnic groups. I grew up in a military family and have lived many places. I’ve been a resident of East Bridge since 2012, and a resident of Stapleton for a total of 11 years. I especially enjoy gardening, reading, painting, and traveling. Professionally, I have worked in many fields and held high level government clearance. Most recently have worked in the public school of our neighborhood. I live with my husband and two daughters (*10, 9). As your MCA district 1 delegate, I will use my passion for social equity and [other positive personal attributes/skills] to serve my neighbors. I ask for your support and promise to listen to your ideas for and concerns about our neighborhood, encouraging your involvement. I am eager to take on this role! I have lived in Stapleton for 15 years and am currently a senior at George Washington High School. I want to make a difference before I go off to college and I believe the best way for me to do that is to work towards making my community a better place. I believe the first and best way to positively change the Stapleton community is changing its name. I believe the name is a bad representation of our community and perpetuates the harms of racism and white supremacy. I believe serving the community means serving all of its members and making it the most inclusive space it can be. As someone who has grown up in this neighborhood, I offer a unique perspective and can be a voice for the youth of the community. I am a Denver native. My wife and I live just across the street from the beautiful Central Park. After living in separate states, commuting back and forth between Denver and Arizona, my wife accepted a job in Colorado. We decided to move to the neighborhood from the Park Hill area in August of 2016. I am also a small business owner, owning and operating Control FREQ, a home automation and systems integration company. I launched it back in 2005 and now have an office located just across the street from the Stanley Marketplace. Having weathered the storms of the economic downturns, with the help of others, I’ve been able to successfully navigate the market and keep the company prosperous. I was a founding member of the Rotary Club of Five Points Cultural District. It was there that I learned to assess the needs of the community, mobilize and address those needs. I also served in a leadership capacity for more than 14 years at Colorado Christian Fellowship in Aurora, Colorado. As the Director of Media, I was responsible for a small budget and for managing a team of volunteers, who were responsible for weekly operations of the audio and visual components of the church. While serving in this capacity, I had the opportunity to work with individuals who had experienced the recent loss of loved ones. I worked with these families to produce the media associated with the memorial services for their loved ones. Due to the limited timeline and sensitive nature of the circumstances, this required a high level of professionalism, sensitivity, and interpersonal skills. Often people have misconceptions about individuals due to their lack of experience in interacting with people who are not like themselves. One of my greatest honors is that I’ve had the opportunity and privilege to work with and learn from a wide range of individuals from various socioeconomic, racial, ethnic, and religious backgrounds. I currently serve on the board of directors for SUN, the neighborhood organization for our community. One of the areas SUN has committed to, is to bring more diversity to the neighborhood. We’ve formed a committee to look at some of the issues responsible for the lack of diversity and are working to address them. I’m looking to bring a more diverse perspective to the MCA secure a seat as District 3 Delegate. Hello! I’ve lived in District 4 for several years and have really enjoyed being a part of this neighborhood and community. As a mom of 2 growing boys, I want our neighborhood to continue to grow into the friendly, inclusive and diverse community that supports all our children and families. I’ll work to make sure that our community welcomes and reflects the broad range of cultures, races and faces from all walks of life that make Denver such a vibrant place to live. As a scientist and professor at the University of Colorado Anschutz Medical Center, I will use my passion for education and social justice to strength ties with our surrounding neighborhoods and institutions. I would like to hear your ideas and concerns, and most importantly, encourage us to be involved and invested in our neighborhood. My family moved to the Eastbridge area in 2005. My three daughters, Cate, Ella and Meg went to Westerly Creek Elementary (Meg is still there), McAuliffe and East High School. My wife, Lori Fox, and I were founders of Tent Night and the Arc Park July 4th Parade. Please don’t tell the authorities, but we may be best known for serving hot buttered rum on Halloween night to cold parents. I’ve been on the Westerly Creek Metro District Board for 4 ½ years, including as Chair. WCMD is the resident / taxpayer special district, which raises the taxes to pay for infrastructure. Five of us defeated the Forest City / developer board members, and opened up the years-long secretive process. I’ve been a regulatory lawyer for 25 years, in the private sector and in government, Including under Attorney General Ken Salazar, and running Denver’s licensing department. I took a break from being a lawyer to run the Children’s Museum for almost 5 years. My community work includes formerly chairing the boards of the Colorado Children’s Campaign and the Colorado Nonprofit Association. If elected as an MCA Delegate, my primary focus will be ensuring fair and open processes and true resident decision-making. My family of (now) four have resided in Stapleton since 2011. I am an Associate Professor in the Department of Cell and Developmental Biology at the University of Colorado Denver, working at the Anschutz Medical Campus. I run a research lab focused on investigating fundamental questions of molecular and cellular biology. I have a BS in Biochemistry and Genetics from Texas A&M University and a PhD in Molecular and Cellular Biology from the University of Washington, in Seattle. Much of what I do for my job is writing grants for funding my lab. Hence, I’m quite familiar with creating budgets and deciding on funding priorities. Much of what I do outside my job is volunteering at my kids’ schools, one of which is in the neighborhood (Izzi B). My favorite part of volunteering is simple: figuring out what I can do to help, and then doing it. Partly as a result of volunteering at public schools, I’ve become more interested in helping the broader community. It brings me great personal satisfaction to learn of an issue that could be addressed by straightforward action, and mobilizing the resources to make it happen. I believe that our neighborhood does most things very well at the moment. Most of my job as an MCA delegate would likely be addressing small issues of concern that residents bring to my attention (like the sorry state of the trees on our mews). I would be happy to fulfill my duties in these simple ways. However, part of the appeal of moving to this neighborhood was the goal (as expressed to us by our realtor) of the community to be diverse and inclusive. I’ve come to realize that this goal is not yet being met. The demographics of this community are, while certainly comparable or even more diverse than other Denver neighborhoods with similar housing price ranges, not what any citizen of the world would describe as “diverse”. Furthermore, one need not spend too much time on neighborhood social media to realize that the community is still a long way from being what a reasonable person would describe as “inclusive” (e.g., not-so-subtle, mostly unintentional racial profiling on NextDoor and Stapleton Community Watch Facebook pages). As a family, we love our neighbors, and recognize in most of them a genuine interest in creating an inclusive neighborhood. However, we also have come to recognize a widespread lack of understanding about how to do so that is not unexpected, given the privilege that most of them (us!) enjoy. It was in this context of awareness about the reality of the racial and economic demographics of our community, and the perception of our neighborhood as being privileged and unwelcoming of “outsiders”, that I learned (after having lived here for 5 years) about the origin of the name “Stapleton”. I was absolutely shocked. It was hard to believe. It made no sense. It was immediately outrageous. But then I began to read on social media some of the comments by members of our neighborhood about the name (to paraphrase): It’s named after the airport! It’s history, let’s move forward. I’m comfortable with the name, so what’s the problem? Then, it started to make more sense. Of course! Look at the demographics of this community — why should there be widespread outrage? The majority of these residents are precisely the people who would be LEAST offended by the origin of the name. It doesn’t bother them — they can go about their daily lives blithely unaware that living Denver residents experienced firsthand discrimination enacted directly or indirectly by Klansmen put into positions of power in our city’s government by the namesake of our neighborhood. No harm, no foul, right? I was born in Colombia and am half-white, half-Latinx. I moved to the US as a toddler and grew up in Texas, where my skin color could have (and maybe did) made me the target of stereotypes and discrimination. However, I had the privilege of being raised by a white father who ran his own research lab, and he gave me a “white” surname and access to opportunities to enrich my academic pursuits and pave the way towards getting into graduate school. In college, I had essentially a full scholarship based not on need or race but on academic success, but I was still strongly encouraged to apply for other, minority-targeted scholarships, and I had mixed feelings when I obtained them — weren’t there others more in need? (There were.) When I arrived in graduate school I was very sensitive about any hint that I received special attention because of my race. I wanted to be judged on merit alone, since I didn’t think I’d had to overcome any racial bias, and I began to believe that all scholarships and admissions decisions should be based on merit or economic status, never race. Despite the fact that I was aware of it, my privilege blinded me to the very real hardships of others, to the fact that our entire society is built upon white culture, and is intrinsically unwelcoming to non-white people. Only many years later did I begin to understand systemic racial bias and inequity, and I became aware of that blinding effect of privilege. (It’s not about me! It was never about me.) I quickly realized that much of my neighbors’ apathy about the name is a manifestation of that same blindness. And then, only then, did I learn about the role of Forest City in actively propagating, perpetuating this offensive name, despite having initially claimed that it was only a temporary appellation. In fact, the name continues to represent an overt, deliberate marketing strategy. “Stapleton” is trademarked by Forest City! The fact that corporate economic self-interest also underlies the resistance to a name change is, for me, even more frustrating. Many people who are on the fence about a name change make a “slippery slope” argument, that changing the name would lead inexorably to changing other names to the point of absurdity. As John Oliver said (to paraphrase): You don’t worry that letting your child have a bag of M&Ms will lead inexorably to that child becoming addicted to black tar heroin! For all processes, there are points where logic, reason and common sense tell us to stop. One of my neighbors pointed out to me that Henry Ford was quite anti-semitic, something of which I was unaware. Should we advocate for a change in the name of Ford Motor Company? First, as far as I know Ford Motor Company does not have a problem with a perception of being unwelcoming to Jewish people. Like it or not, our neighborhood does have a problem with a perception of being unwelcoming to people of color. Just ask people of color from outside our neighborhood — I have. Second, I am not a stockholder in Ford Motor Company; I don’t even own a Ford car. I have no influence over that company’s decisions, and public perception of that company does not affect me. I am, on the other hand, a resident of Stapleton, and public perception of our neighborhood does affect me. It prevents people of color from visiting and moving here, which detracts from my quality of life. Another assertion is that a name-change effort detracts from other efforts that will have “real” impacts on “important” issues facing the community. Social progress is not a zero-sum game. Making one relatively small, relatively easy step does not make it harder to tackle larger, more difficult issues; on the contrary, it makes it EASIER. A name change could bring about a significant change in the perception of our neighborhood by the broader Denver (even national) populace, and fuel further progress, not hinder it. For those residents that are “informed” but nonetheless “feel comfortable” with the current name, I feel pretty safe in guessing that their comfort is a result of privilege, the same privilege that I also enjoy. Those of us who seek inclusivity are not seeking to support the privileged, we seek to support and welcome those who have been systematically ignored and overlooked. They are no less important parts of our community. There is also a perception that a name change would be too expensive. Who would pay? At the MCA Delegate forum I attended a few weeks ago, the MCA brought in a lawyer who gave an estimate for what it would cost. He took an extreme view, in which all existing materials featuring the name would be destroyed and replaced immediately, including business cards, logos on the sides of maintenance trucks, EVERYTHING. This is NOT what I would want. As your Delegate I would advocate for removing the largest and most obvious signs from building around the neighborhood, and ceasing the production of any NEW materials with the Stapleton name. The other materials are already scheduled to be replaced on a regular basis, and they would simply be replaced with new materials featuring the new name, once that is decided. The MCA has a $7m annual budget, 10% of which is devoted to “Program Activities” whose goal is to bring the community together. I’m pretty confident I could help find funds to support a fair, transparent name-change process. Many residents who are uncomfortable with changing the name worry about the costs to local businesses whose names include “Stapleton”. This is definitely an important point, but I want to emphasize that I in no way plan to demand that these business change their names, and I will not judge the businesses or their owners if they are unable to immediately change their names. These poor business owners were fooled into using this divisive name by a corporation (Forest City) that tried to bury the name’s history, although they were well aware of it at the time, and I do not find fault with the business owners. I do believe that they will want to eventually change their names, as have a number of businesses already (Neighborhood Music is the first one that pops into my head), but I do not want this to be a burden to the community. Finally, the neighborhood has fallen far behind its affordable housing goals. Combined with the neighborhood name and the perception of the neighborhood as being elitist and unwelcoming, this is a major obstacle to diversity. I would work to try to improve this problem. If any of you made it this far down this post, I am impressed! Thank you for your interest in your community. My name is Caley Orr and I’m running for MCA District 8 Delegate because I believe we can do better to live out the promises of the “Green Book”, Stapleton’s Development Plan. We are privileged to live in a neighborhood with beautiful open spaces, parks, and other amenities; however, we fall short of our goals when it comes to the development’s guiding principle of social equity, socioeconomic and racial diversity, inclusivity, and the creation of strong ties between us and surrounding neighborhoods. Nevertheless, I have faith that as a community, we genuinely hope to meet these worthy aspirations. Changing our community name is one important step forward. We need to rename Stapleton utilizing a fair and democratic process that considers the input of all residents. As your delegate, I will work to ensure that our community spaces, events, and programming are providing opportunities for people of all ages, incomes, family situations, and ethnicities. I grew up in Colorado and completed my bachelor’s degree at CU Boulder. I lived out-of-state for many years pursuing my career, but I was fortunate to return in 2014 and am eager to be involved in the place I love and truly call “home.” Since returning, I have lived in Conservatory Green with my wife of 11 years (and now our infant daughter). Professionally, I hold a PhD in anthropology from Arizona State University and now have my dream job as a CU professor, in which I conduct research in my field and teach anatomy to students of the health professions. Anthropology provides a strong intellectual appreciation of human diversity, but it is my students and the friendships I’ve forged with folks from all walks of life that truly motivate me. As your MCA District 8 delegate, I will use my passion for social equity and democracy, strong organizational skills, and genuine interest in people to guide my service to the neighborhood. I ask for your support and promise to listen to your ideas and concerns on all matters. I have lived in Stapleton for 13 years, both of my daughters have grown up here, played here, gone to school here. I’ve lived in the South End, and recently moved to Willow Park. I have watched this neighborhood blossom into the amazing community it is and look forward to all the things it can be in the future. I am a working mom, I have been a stay at home mom, I started and ran a small business. I come to this role with experience from many perspectives, and I’m proud to have the chance to represent my neighbors! PLEASE DO NOT MAIL BALLOTS any longer, because they will not arrive in time. CALL FOR PICK UP, e-mail, or attend the meeting! Thank you! CONTACT US with any questions! Each candidate has provided their e-mail address on this page. The President of the organization, Genevieve Swift, can be reached at 720-583-6803 or at renameforall@gmail.com.